Ok, I know some of you may be thinking the word “Greyt” above is either a typo or I just plain do not know how to spell, the truth is, “greyt” is how greyhound devotees spell the word “great” when referring to anything to do with the greyhound breed. If you are ever lucky enough to own one of your own, you will think they are GREYT too! Planet Greyhound is dedicated to those wonderful creatures, former racing greyhounds who have been rescued and are now living the retired life and to all the wonderful people who open up their homes and their hearts to them. This blog will strive to bring you the information you need to make a decision on whether this is the right type of pet for your family. Thousands of years of specialized breeding have resulted in the most remarkable breed of dog known to man ~ the Greyhound. The Greyhound’s streamlined body is that of the ultimate canine athlete, which has not significantly deviated since ancient times. Greyhound or Greyhound-like canines have appeared throughout the centuries in artistry, poetry, literature, and within the tombs of the ancient pyramids. The exact historical origin of the Greyhound is unknown. Its origin has been thought by some to be Africa, Greece, Middle East, or Turkey. We do know, however, that the Greyhound’s historical lineage is greatly rooted in ancient history dating back thousands of years, making the Greyhound the oldest purebred canine. Some say the Greyhound dates back over 4,000 years. Throughout the ages, Greyhounds have been bred for one thing ~ Raw Speed, in particular, acceleration. Greyhounds are a member of the sight hound family and primarily hunt by eyesight, as opposed to other canines, which use scent. Greyhounds have the ability to see small objects up to ½ mile away. Another characteristic of the sight hound is the instinct to chase. Greyhounds are noted for reaching speeds up to 45 mph in only three strides. Together, throughout history, these attributes made the Greyhound an excellent and well-adapted hunter. Despite what some may think, the word Greyhound does not come from their color. In fact, there is no real “gray” Greyhound. The closest thing to “gray” is a “blue” or “steel” color, and it is not common. Whatever their exact lineage and name derivation, Greyhounds are one of the most unique breeds in the world, recognized for their elegant appearance, grace, gentleness, agility, and speed. The sight and silhouette of a Greyhound running, full speed, muscles contracted, legs stretched, muscles rippling, is a rare beauty in respect to the rest of the canine world. These remarkable creatures have been a symbol of pride and respect for many great civilizations. Greyhounds were the most valuable possession of the Egyptian Pharaohs, adored for their speed, grace, elegance, and loyalty. Cleopatra and King Tutankhamen both had Greyhounds. Figures of the Pharaoh’s Greyhounds were often carved into the walls of their tombs or mummified along side their masters. In ancient Egypt, the birth of a Greyhound was often second in importance to the birth of a son. Entire families would mourn the passing of a Greyhound by shaving their heads, fasting, and weeping out loud. The first mention of any canine breed in literature dated back around 800 BC. In Greek literature, a book called “The Odyssey” told a story of a man named Odysseus who left home for 20 years. When he arrived home, the only one who recognized him was his Greyhound “Argus”, who was only a puppy when he left home. In the Middle Ages, Greyhounds nearly became extinct due to famine and disease. Fortunately, priests and clergymen took special care to protect the Greyhounds, and later bred them for noblemen. Around the year 900, the King of Wales ordered that the punishment for the killing of a Greyhound was the same for the killing of a human ~ death. In the year 1014, King Canute enacted the Forest Laws, stating only persons of nobility were permitted to own a Greyhound. In Britain, Greyhounds were appreciated for their well-adapted ability to hunt. Also, in Britain the ownership of a Greyhound was a symbol of pride and nobility. Hence, the popularity of the Greyhound grew very popular among the elite. Greyhounds eventually made their way to the United States in the late 1800’s to help control the jack rabbit population. The modern day Greyhound still retains all the attributes that made it so treasured throughout the centuries. Greyhounds are known for their gentleness, patience, and sensitivity. They have personalities that tend to want to please their families and a tendency to bond very deeply with their family. Greyhounds are among the most loyal of canine companions. They are extremely intelligent and have the ability to acclimate to their new home very quickly. Greyhounds are very clean and do not have a “doggy” odor like most other canines. Many can live in harmony with other pets such as birds, cats, small animals, and other exotic pets. 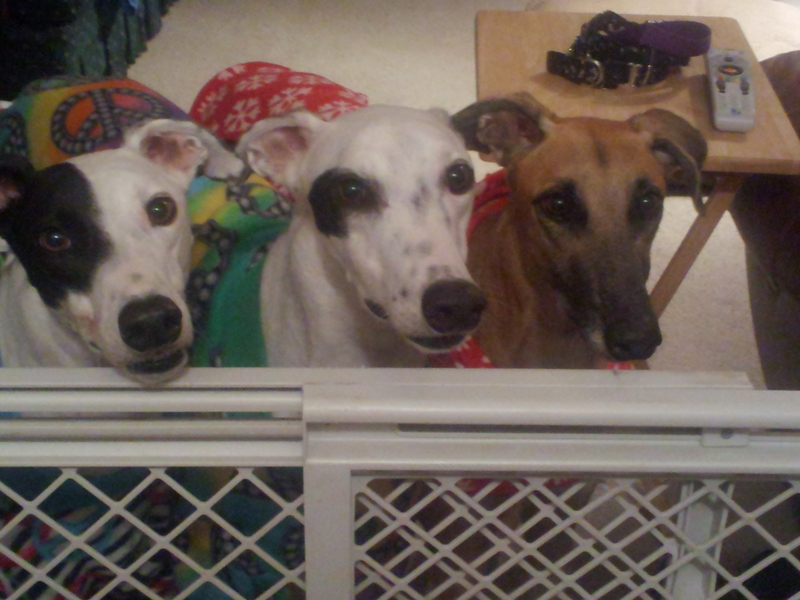 Sharing your life with a Greyhound will change your life in more ways than you can imagine. They will provide you with a lifetime of enrichment. Through proper care, love, understanding, patience, and encouragement, a Greyhound will learn to trust you, love you, and form a bond with you so strong it will last a lifetime… and beyond. Despite their previous life as an “institutionalized” racer, a Greyhound will, if given the chance, become a valued, beloved member of your family. Beautiful tribute to our greyhounds. But they are so much more in how they enrich our lives. Thanks!